Homeopathic Consultation: No Cure – No Pay! Cold & Flu are two different things. Both are caused by different types of viruses. This means that eating antibiotics will not help as antibiotics work on bacteria and not virus. Having said that, there is a Fast Proven Natural Cure of Cold and Flu, keep reading to learn it. Cold is also called Common Cold. It’s symptoms are mild (runny nose & sneezing) and you can continue your daily routine even when you have a Cold. It cures on it’s own within 5-7 days and no treatment is necessary. Flu on the other hand is more severe. It is caused by a virus known as Influenza. It’s symptoms are more severe (fever, body aches, sore throat etc) and carrying out daily routine with Flu is difficult. It can take 2-3 weeks to fully cure on it’s own. 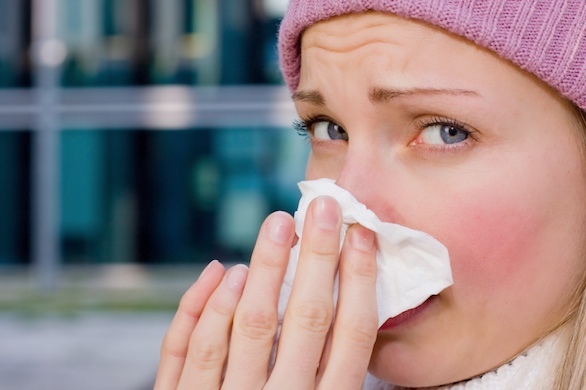 There are a number of complex reasons which makes treatment of Cold or Flu almost impossible. There are many home remedies, allopathic medicines, homeopathic remedies etc. which can reduce the severity of symptoms but no matter what you take, you will still have to complete the 5-7 day cycle to get perfectly well again whether it’s cold or flu. If you don’t have access to anything other than your kitchen, then you can try the following home remedies as they can reduce the symptoms of Cold or Flu. Only homeopathic remedies offer Fast Proven Natural Cure of Cold and Flu. They have the unique combination of being the safest & fastest with no side effects and get you healthy again. – Use our Free Smart Remedy Finder to find the remedy fitting your symptoms. It takes less than 5 minutes. – It will drastically reduce the duration of your illness. Important Note: After taking the right remedy, your nasal discharge will continue as your body needs a way to get rid of the infection but your overall feeling of wellbeing, energy, appetite, stamina etc. will improve substantially within 12-24 hrs. – Extremely cheap. Homeopathic medicines (called remedies) cost less than $10 for more than 5 (five) years of supply! If you are familiar with homeopathy and want to treat yourself, you can use our FREE Smart Remedy Finder to find the right remedy within minutes for many ailments & injuries along with detailed prescription guidelines on how soon to expect improvement, when to repeat the dose etc. If you want us to find your remedy and manage your case, please use our Online Homeopathic Consultation which comes with a No Cure – No Pay promise i.e. we will treat you for one month without any fee, if you are satisfied with the results within one month, you pay us at the end of the month. If you are not satisfied, we stop the treatment & you go free.